Summary The new headquarters of the "Studio Lamela Architects" has been designed following a detailed environmental strategy. The building floors are elevated, with a basement open configuration. 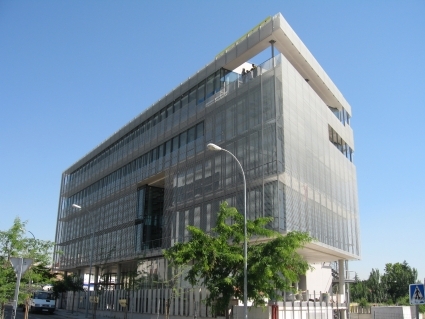 Building envelope is a double skin, with an inner glass surface protected with horizontal lamellas for direct solar protection and a metallic framework (tramex) for maintenance of glass surface and lamellas. Materials selected are natural (stone, wood) and recycled (aluminum, façade glass and concrete for the building foundations). The energy strategies include reducing air conditioning needs with a double skin for sun protection, increasing efficiency through the use of centralised and flexible systems, lighting sensors and the use of renewable energies (6 m2 of solar thermal and 250 m2 of photovoltaics).